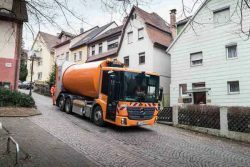 Waste Management Stuttgart (AWS) is very aware that it operates in a city challenged by excessive particulate matter pollution and where the city managers are formulating the terms and scope of a diesel ban, an action recently upheld by Germany’s Federal Administrative Court. To navigate the city for environmentally sensitive collection of waste requires specialised vehicles and a Euro VI natural gas fuelled solution is meeting the brief. Stuttgart is the headquarters for Porsche SE’s Volkswagen and Daimler’s Mercedes-Benz. The latter was selected by AWS to supply seven new Mercedes-Benz Econic NGTs (Natural Gas Technology), commissioned for city service in February 2017, thereafter followed by an order for three more. In a major expansion of its efforts to reduce particulate and noise emissions, AWS now plans to acquire 30 more Econic NGT refuse trucks equipped with Allison 3500 fully automatic transmissions. The Econic NGT operates with compressed natural gas/biomethane. Allison Transmission says natural gas engines are more responsive when joined to an Allison Automatic. Torque converter technology multiplies engine torque to significantly improve start ability and launch, even on steep grades. With the torque converter and a deep first gear ratio, the Allison 3500 enables ideal performance in variable terrain. In addition, the helical gears of the Allison transmission in combination with the natural gas engine help to reduce noise compared with a diesel engine. 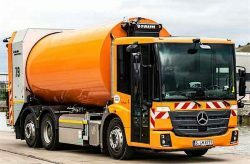 According to measurements in Stuttgart of trucks during a drive cycle, the noise emissions of the Mercedes-Benz Econic NGT are 78 dBA, while the measuring instrument displays 80 dBA for a typical Euro 6 diesel engine. Throughout Europe, governments have banned or are considering bans on diesel vehicles in city centers as a way of reducing pollution. 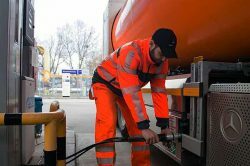 Although some fleet operators are exploring fully electric vehicles, vehicles using alternative fuels such as natural gas are less expensive to acquire and are already supported by fueling infrastructure. Besides virtually eliminating particulates, Mercedes-Benz Econic NGT vehicles emit about 23 percent less carbon dioxide than vehicles equipped with a Euro 6 diesel engine, according to tests performed by Daimler. The AWS refuse trucks are equipped with the new, 7.7-liter Euro 6 M 936 G natural gas engine that produces 222 kW (298 hp).